While it is still nice to stop by a store to touch and see products, the convenience of online shopping cannot be beaten. 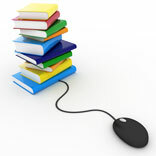 And for some services, such as buying books, online shopping has made the process much easier and more efficient. Books are an ever present part of our lives, be it in the hard-copy format or the soft-copy version. With the influence of technology and convenience absorbing us rapidly, the future of books being read in the physical form was coming under serious threat from their electronic counterparts, largely encouraged by the uptake of tablets, e-readers, etc. So the recent global survey conducted by Nielsen, which states that books are the most sought-after product category when it comes to online shopping, comes as a pleasant surprise. In 2007, the most dedicated shopping portal for books in the country, popularly known as Flipkart, was launched. The likes of Infibeam, nbcindia and rediff.com were also launched on this vastly-spread platform. “While working on e-commerce portals, it is important to invest in technology extensively. A robust back-end results in a great user experience. A feature rich website, smooth user interface and hassle-free browsing and ordering – these are our strengths and it is all because we believe in technology. Being an online store, we save a lot on overhead costs. This model enables us to pass the savings on to the customer,” says Ravi Vora, VP-Marketing, Flipkart. So what really makes these respective players stand out within this very complicated yet potentially most viable platform for selling books? There are a couple of things that need to be taken care of if one sees oneself on a long-term scale. First and foremost are the logistic and warehousing operations, which are primarily the major ingredients for an e-shopping portal to become a success. There is no dearth of online shopping portals for books, but what makes the best stand out is their servicing, ie delivery, customer support, etc. “Setting up an e-commerce website involves catering to a lot of aspects, including setting up product supply chain, technology setup, payment gateways, managing the hosting infrastructure, warehouses, logistics, etc. Retail is competitive and doing all these can involve an investment of millions of dollars over a long period of time. One can set up a website and start selling within a few hours without having to write a single line of code or worry about technology, hosting, payments, etc. Through this initiative, the business owner can focus on his main strategy and product.” says Sachin Oswal, COO, Infibeam.com. Flipkart sees majority of its sales coming from the metro cities. However, tier II and tier III cities are slowly picking up and their sales are growing to match the demand generated in metros. Internet penetration within the non-metro cities is yet to be nurtured and looking into the changing demographic factors, one can be sure of these cities taking off in the near future. “Infibeam ships to all locations in India, including Tier I-V cities. Maximum sales are from the top 8 metros, viz Mumbai, Bangalore, Delhi, Kolkata, Chennai, Hyderabad, Pune and Ahmedabad. We’ve also seen a lot of sales coming from areas such as the North East, where availability of books is a problem. We’ve shipped books to more than 20,000 pin codes,” Oswal adds. The additive factor that people have rapidly inclined to the e-shopping mode is their attractive offers. While Flipkart is offering discounts ranging from 15 per cent to 35 per cent, which is quite substantial as compared to bookstores, Infibeam offers discounts ranging from anywhere between 20-60 per cent, with 50 per cent discount on the top sellers and an average discount of 20 per cent on all books. Where there is light, there has to be some glum. Same is the case with the online shopping platform in the country, which is primarily due to the lack of cohesive logistic operation to ensure smooth stocking and delivery of books as well as maintaining uniform warehousing set-up. “There are quite a few challenges that we have faced in the past and continue to deal with today. These range from front-end experiences like keeping the website up and running 24X7 to trying to ensure smooth payment gateways,” says Vora. Infibeam has its own call centre to cater to its customers and ensure 100 per cent customer satisfaction. It has also introduced cash-on-delivery payment mechanism to ease the buying experience for customers who are not very comfortable with the e-payment process. In the back-end, problems like storing a large inventory and trying to keep the delivery time to the minimum are the biggest challenges that the e-shopping players have to come across, which for a country like India with its vast geography is a high risk proposition. No matter how soon the tablet e-revolution engulfs the whole country, the hard form is here to stay and now that the services within the platform are maturing to its potential and growing ever so more, one can breathe a sigh of relief as the books that one has always cherished will be in existence in the foreseeable future.